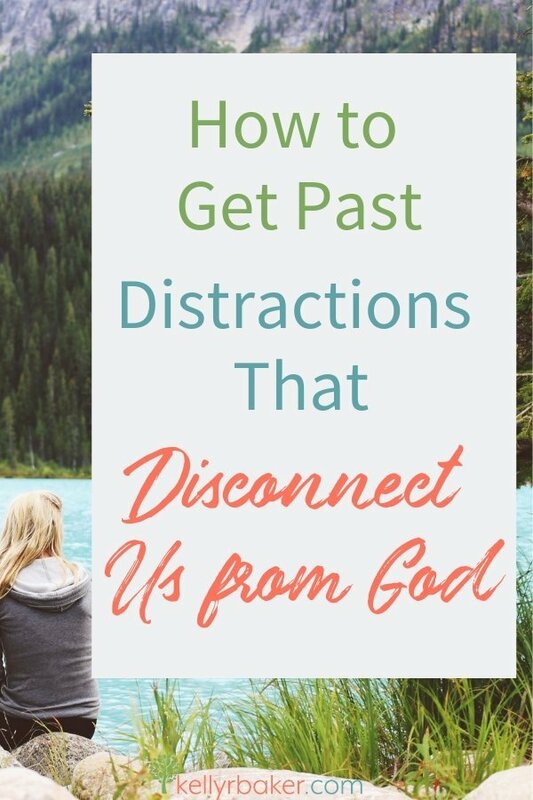 We all have distractions that can disconnect us from God, right? But this post is more than a talk about the perils of distractions. It’s more about our connection with God—and finding intimacy in it. our slightly inclining street, uncomfortable perspiration beginning to make its appearance. My muscles starting to clamor a louder complaint, yet I walked on. I kept trying to push it all out because I wanted to sense God’s presence. I wanted to hear from Him on something major. The problem is, I didn’t realize that I was multitasking as I’m prone to do. What did I expect? A text message from the sky? God: Say this. Do this. Write this. Me: Got it. Over and out. I wanted a quick response from Him. Fast. Easy. Clear. But God isn’t a magic genie from on high. He desires face time like any other friend, and I don’t mean FaceTime. It wasn’t until later when in a solitary place to seek His face that I pressed into worship. I sensed His strong presence. And that moment marked the beginning of a revival in my heart—a burning in my spirit for realness. I desire His realness in my walk, and in my words, and in ministry. So I’m done trying to figure out if I’m a writer who speaks or an occasional speaker who writes or if I’m a worship leader with a blog. It’s none of those and it’s all of those because really I’m a messenger. But I want to be done with my agenda and let Him have His way. I desire His voice overlaid on mine, booming so mine isn’t even there. Let His glory shine all over this blog. I am done sharing His glory. Besides hearing the directions I hoped to hear, He showed me: the exchange of my glory for His comes with basking in His presence. The desire for that comes with intimacy. We are changed in His presence. It doesn’t come with being in stages of comparison to others nor in stages of disconnect in our relationship with God. My goal is to not only help you draw closer to Him through having a Daily Time with God but to reconnect you to His arms. Because subtle disconnections come through hurts and busy days and other ways. I’ll keep encouraging you to run to His arms and stay there. Yes, my friend, stay there and thrive! If you are in a lasting embrace with someone, that is an intimate position. We crave intimacy and often seek to find it through people and things. God is the only way to receive that fulfillment. See, there’s you and me gathered (and much more we can’t see—but that’s good because we aiming for no distractions here). Jesus is among us. So ignore everything else but Him for a moment. He is here. Breathe His name. Let Him know that you desire to have an intimate relationship with Him. Talk to Him about anyone or anything else that is contending for His place of intimacy. Father God, You are welcome in my life. Have Your way in my heart. Take me to a walk of greater intimacy with You. Lord, the people and things in my life that I’ve chased as the fulfillment of Your love—I let go of them now. There is nothing on earth that can fill the God-shaped hole in my heart but You. I desire to connect with You daily. Help me run away from distractions straight into Your arms. Envelop me in Your presence. I love You. Thank You for being jealous of my love and loving me. Amen. Wow! God is matchless, isn’t He? Sometimes my heart feels like it will explode with emotion for Him. In all human relationships, there is an ebb and flow of closeness that increases and decreases. What I *love* about God is His everlasting faithfulness. Want loyalty? You got it in God! The problem is sometimes we increase and decrease in closeness with God. 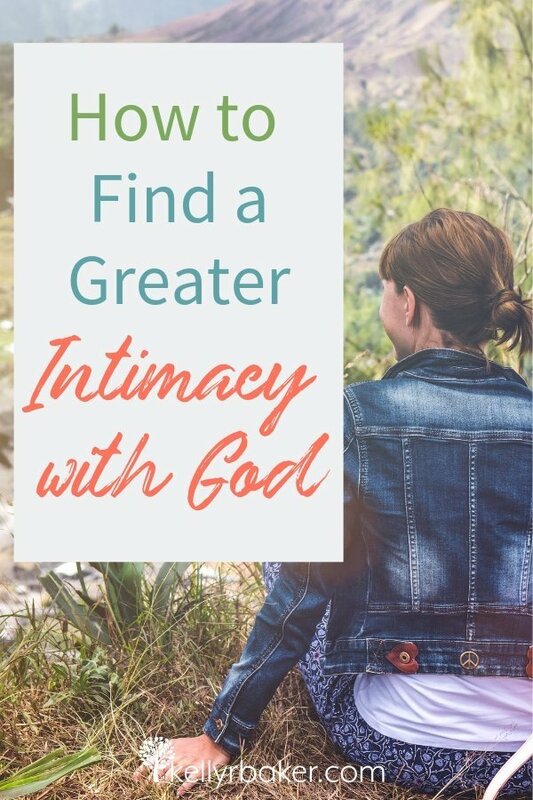 Perhaps today, you would like help to build the habit of intimacy with God. Take the Daily Time with God Challenge! Like this post? Pin it for later! Use the icons below to share it. Your friends will be glad you didn’t keep it all to yourself! Less than a minute to pin it! Kelly, I am so with you on accidentally multi-tasking while talking with God and wondering why I’m distracted and not really connecting. Guilty of that in human relationships too! That point will stick with me. Thank you! We all tend to want those quick responses. Just give me the bottom line. Yes or no. But what God wants, as you said so well, is us … our hearts, our attention, us! Thanks for sharing. Yes, He does! The thought of that boggles my mind. God bless! We are changed in his presence. Yes! “He showed me: the exchange of my glory for His comes with basking in His presence.” Love this, Kelly. I want to appreciate his presence more than his presents! Me too, Lisa! Years ago at church someone talked about seeking His face, not His hand. That has come to mind when my times with God have felt dry. Kelly this right on. I am feeling big time, this week in fact – I had a personal revival as well. I, once again had to lay it all down (pride =yuck). I am having a hard time with the book I am writing because it talks about letting go of the pressure to perform so you can pull back and hear God’s voice over the noise. I can’t explain it except that when I went back to him and broke down about it all, I simultaneously felt peace while feeling more targeted than ever spiritually. I will be praying for you. I am glad I read this today. Sometimes we get to feeling like we are the only ones but that is just not true. Love ya girl!! Yay! I’m happy to hear you’re having a heart revival, too. Thanks for sharing that encouraging testimony of God speaking to you. I’ll keep praying for your writing, my friend! Amen, Ruth! Blessings to you! Seeking that lasting embrace. Great post, Kelly! Glad to hear it! Thanks for stopping by! In our fervor to “serve” God, we forget that he wants our hearts. In our pursuit of knowledge about God we forget that He wants us to pursue Him for His own sake. And it’s so amazing that He desires to be with us. Back again, and once again reminded of the importance of relationship in this following life!